Are you ready for yet another great year-end Christmas Celebration with family and friends? Bought the beautiful Christmas tree to decorate your house? After all, Christmas is all about great preparation and you don’t want to miss a chance to grab Santa’s attention. 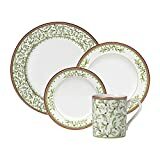 The 12 piece dinnerware set designed with durable milk-white porcelain earthenware and has rich green banding. It is perfect to serve 4 people and can be used easily in dishwasher, oven, freezer and microwave. With Christmas style designing, the Spode Christmas tree makes a great Christmas present for your loved ones. 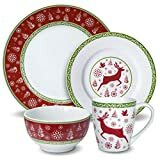 Great red and white combination dinnerware is the best match for your dining table on a beautiful Christmas evening. The dinnerware set is made of high-quality porcelain and meets the quality standards. Dancing snowflakes pattern on the plate and mug gives the great festive feeling. VEWEET’s dinnerware set is crafted using the highest quality porcelain which converts itself into glass-like substance when in the microwave. Therefore, it is more resistant to cracking and makes for a great Christmas dinnerware set. The premium feels and chip resistant rounded edges make it look as new as its first serve. Suitable for use in the dishwasher, oven, microwave, and freezer. The beautiful white dinnerware is really strong and durable. It is made from porcelain that vitrifies when the temperature exceeds 2480 degree F and this makes it last longer than earthenware or stoneware. Cracking and chipping are avoided as Melange dinnerware effectively blocks moisture absorption. Rounded edges provide additional chip resistance and sleek look. Beautifully designed to suit your festive needs, the Mikasa holiday traditions dinnerware set is suitable for serving 4 people at a time. Red, green and white colour combines to give the elegant look that is perfect for not only Christmas but for other festivals of the season as well. The plates have charming berry and holly borders on the outer edge. The compact dinnerware set is best suited for serving one person. It includes an all-purpose bowl, bread and butter plate, accent plate, salad plate, and mug. Accented with 24K gold and designed of Bone China, the dinnerware is exclusively designed for the rich taste. Treat your taste buds in the premium Lenox dinnerware set of 12 pieces. 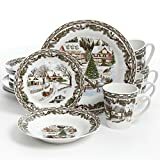 Another great dinnerware set from the Christmas berry collection of Melange. The set consists of chip resistant Melamine Bowls and Plates, Salad plates, Dinner plates. Due to the high Melamine content i.e. 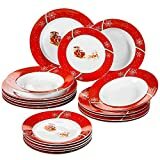 100%, the dinnerware set is scratch proof and highly durable. It is meant for both- indoor and outdoor use. The cleanup of the set is very easy as it is dishwasher safe. 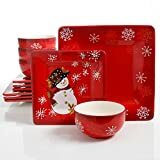 The Red Christmas Themed Laurie gates snappy snowman dinnerware set is all set to charm you with the vintage look and festive appeal. Made of the material of Dura stone, it has comparatively better resistance to breakage than most of the other materials. The vibrant colours have the charm to make the aesthetic appeal on the Christmas evening. 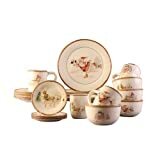 Multicolor 16 piece Gibson home Christmas Toile dinnerware set is made of Porcelain and can serve four people in a go. The traditional look of the set makes it suitable for any kind of occasion. Serve your guests in the most traditional yet strong dinnerware set or gift it to your loved ones. The earthenware 20 piece dinnerware set has a cream eye-catching colour. The look of the set is completely traditional and can revive the spirits at a gathering or party. Care must be taken when used in the microwave as the dishes may become hot when placed in the high temperature.